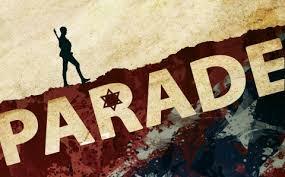 Anti-Semitism Musical ‘Parade’ Opens at Footlighters Theater – The Perfect Story for our Times! Footlighters Theater in Berwyn is the oldest community theater on the Main Line, providing quality, reasonable entertainment for over 80 years. As a theater-lover, there’s nothing better than community theater and Footlighters is one of the best! A bit of history about Footlighters Theater from their website — the group organized in Wayne in 1929 when T. Baynard Beatty, principal of Radnor High School and himself, an experienced drama enthusiast, held an open meeting for those “whose interest centered on mutual entertainment and the development of dramatic abilities.” Originally the Footlighters were sponsored by the Saturday Club of Wayne and performances were held at that location. In 1973, Footlighters moved to Berwyn, to the historic Berwyn M.E. Church (c. 1888). After a period of 10 years of leasing the space, the Footlighters mounted a Capital Campaign and purchased the building. Improvements have been made to the building but it still retains its original charm, including an intricately carved beamed ceiling and original stained glass window. Little did Footlighters know that when they planned the final production of the season, “Parade”, that it would be such an ideal choice for the times! Parade is a remarkable musical which tells the story of Leo Frank, amid a background of anti-Semitism in America in 1913. To purchase tickets — click here. A description of “Parade” from Bill Elms Associates of UK are below. The words, “Parade is filled with soaring music and a heart-wrenching story, offering a moral lesson about the dangers of prejudice and ignorance that should not be forgotten” are as appropriate in 2018 as they were in Georgia in 1913. “Parade” is a perfect reminder for all of us — I plan to attend a performance.